Denver, CO – Commercial kitchens and other food preparation establishments are under constant threat of fire. Not only is there extreme heat, but grease buildup can create a literal tinderbox situation that could spark at any moment. If a fire breaks out, your staff may be trained to reach for the nearest chemical fire extinguisher. Or, your establishment may employ automatic fire extinguishers that put out the fires for you before they can threaten lives and property. However, should you be worried about any of those chemicals tainting the food? Here are the facts commercial food preparation establishment owners should know before disaster strikes. Immediately after putting out the fire with chemical fire extinguishers, the establishment should close. This doesn’t mean that the facility should close if a tiny fire breaks out that did little damage. But a major fire could be a health hazard due to the acrid smoke, so you’ll want to contact the health department immediately. Only a health department official can give approval before you are authorized to reopen to the public. The health department may also instruct you to throw out some canned and dried good that may have become damaged. This isn’t only because of the fire extinguisher chemicals. When a fire occurs in a commercial kitchen, the extreme heat can cause jars and cans to split and rack, which can allow contaminants to enter and taint the food inside. Even if the cans and jars on your shelves appear as if they have sustained little or no damage, don’t take the chance. Heat may have caused the food to spoil, and you wouldn’t know until you opened the can and tried to feed it to your guests. While the chemicals in extinguishers are designed to mitigate damage from fire as much as possible, unfortunately, they can’t do anything about smoke. Hence, smoke combined with the chemicals emitted by the extinguishing system can penetrate the packaging, plastic wrap, and even get under bottle caps and screw tops in some cases. Therefore, all exposed food, as well as food that appears tightly wrapped up and untouched, may all need to be thrown away. Why Use Chemical Fire Extinguishers? In the past, commercial food establishments made heavy use of deep fryers filled with animal-fat based greases and oils. In recent years, kitchens have moved away from animal fats and moved toward more vegetable-based oils, which offer lower fat and cholesterol content. Unfortunately, vegetable oils tend to burn at higher temperatures than animal fat-based oils, which creates a fire danger that’s difficult to extinguish. 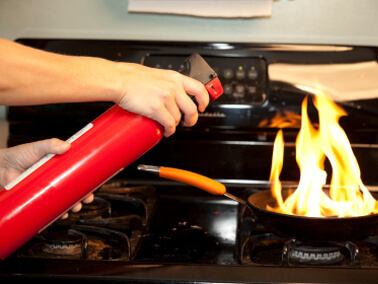 For that reason, many kitchens today use Class K fire extinguishers that make use of wet chemical agents. These chemicals are more efficient at fighting fires, they prevent re-flashes, and offer a cooling effect you just can’t get with dry chemical fire extinguishers. The lesson is that while chemical fire extinguishers can put out fires quickly and cleanup is usually a breeze, there could be some damage to your food supplies after the fire has been put out. Once again, when fire strikes, call the health department after the chemical extinguishers have done their job. Then you’ll get your answer regarding the purity levels of your food, and how much you’ll be able to salvage when putting out fires with chemicals. To learn more about fire safety in commercial kitchens and other matters regarding fire extinguishing in commercial kitchen establishments, contact Nationwide Fire Protection in Colorado, California, and other states around the nation.